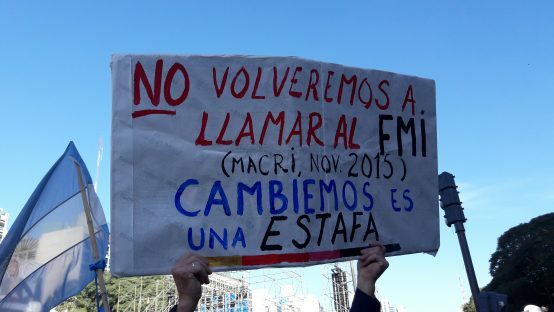 March against the IMF in Buenos Aires, on the occasion of May 25 - Credit: Gastón Cuello - Translation: "We will not call the IMF again", Macri Nov 2015. "Let's Change" is a scam. In September, the IMF increased Argentina’s original $50 billion loan agreed in June, bringing the total programme to an unprecedented $57.1 billion over three years. The programme was agreed in the face of Argentina’s financial crisis, the underlying cause of which was a rapid build-up of public and external debt, accelerated by abrupt financial deregulation by the Macri government (see Observer Summer 2018). 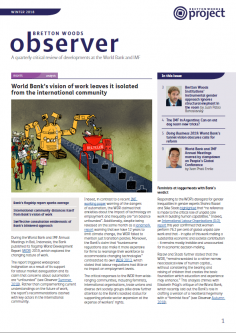 IMF policy prescriptions: treatment worse than the disease? Through its programme, the IMF, which former Argentinian Central Bank Governor Alejandro Vanoli described in November as having “total control of economic policy”, prescribes a familiar policy mix with the aim of eliminating the primary fiscal deficit by 2019. To achieve this, the agreed IMF loan programme includes “an increase in [grain] export taxes, scaling back energy subsidies, containment of capital spending [that] will be compensated for by Private Public Partnership projects, limiting [tax] exemptions for cooperatives and mutual organizations, a reduction of discretionary transfers to provinces,” and, “a freeze in the new hiring of public employees”. Argentina’s past experience proves this approach has not worked – and is likely to make things worse in the short-term. Independent estimates suggest that it will “require at least $40 billion in the next 14 months” alone to keep Argentina solvent, with another $48 billion projected to be needed in 2019, and that is still considered optimistic by some. In its own first review of the loan programme in October, the IMF assessed Argentina’s debt as sustainable, “but not with a high probability”, seemingly acknowledging the likelihood of its baseline assumptions not holding true and Argentina once again becoming insolvent. This begs the question of why the IMF is not following its own 2017 advice on the necessity of underpinning debt sustainability assessments with “realistic – rather than heroic – assumptions”, where, “it is not feasible for the problem to be solved through further belt tightening,” and instead turning to sustainable debt restructuring, as long suggested by civil society organisations such as Belgium-based Eurodad. Without requiring upfront restructuring of Argentina’s current debt stock to private creditors, the programme will continue to “put the burden of adjustments entirely on the shoulders of Argentina’s population,” according to an October Eurodad blog, in particular on the poorest and most vulnerable. With the programme taking place in a context of a cost of living increase of 54 per cent during the past two years, mass public layoffs, a decline of 12 per cent in average salaries, quadrupling of gas tariffs and a six-fold increase in electricity rates, it should come as no surprise that only three months after its introduction, regional ministers declared a state of food emergency, while poverty was reported to be spreading “like wildfire” by October. Responding to concerns raised in Argentina, in an October interview, the IMF’s Managing Director Christine Lagarde highlighted the programme’s social protection minimum spending floor as a safeguard for the most poor and vulnerable, and expressed hopes of enforcing a new “safety valve” in allowing increases in social spending, “if the situation improves”. Having calculated that the social spending floor in the current programme amounted to $6 for each of Argentina’s 13 million poor for the last six months of 2018, Argentinian civil society groups described these safeguards as “a mockery”. This reflects a wider civil society critique on the inadequacies of the Fund’s approach to social protection floors, which can exclude large numbers of poor people, as recently brought to the fore as the Fund designs its new ‘strategic framework on social spending’ (see Observer Summer 2018, Spring 2018). As a predictable result of these policy choices, the country has been paralysed by mass general strikes and historic mobilisations under the banner, “no to the IMF, no to adjustment”. Despite the supposed urgent need for more belt-tightening, according to national newspaper the Buenos Aires Times, ahead of December’s G20 Summit, Argentina nonetheless found the resources to invest, “100 million pesos in the purchase of…180 shotguns, 15 million rubber bullets, 2,000 tear gas projectiles and police vests,” for the occasion (see Observer Winter 2018). Thus, the IMF is choosing to continue to apply its old broken model in Argentina, insisting on a familiar adjustment programme, while many economists, civil society groups, trade unions and the United Nations continue to offer alternative solutions. One such example is the establishment of an international debt workout mechanism, another is the use of human rights impact assessments (as the UN Committee on Economic, Social and Cultural rights recommended to Argentina in October) to guide macroeconomic reform programmes. The question is whether the IMF is capable of changing course.